Custom printed 3.3.75 x 3.375 x 1.6875 non- adhesive memo cubes 4 colors, 2 designs are perfect for casting appeal on the crowds, who are reluctant to accept you. 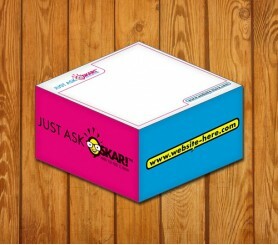 You can always use the large imprint space over edges for positioning your business information before gifting. Whether offered as an office stationary, employee encouragement gift or branding token, personalized memo cubes are sure to make an impact on the intended user. Great for tradeshow gifting because we offer sheet imprints and attractive price savings on bulk orders of these personalized memo cubes. Request a quote to know discounts that you can avail on bulk ordering these customized 3.3.75 x 3.375 x 1.6875 non- adhesive memo cubes 4 colors, 2 designs. * Price includes 4 standard colors screen printed SPOT and 2 side designs. Sheet imprints offered on orders of 250 or more.